New Kickstarter book charts how the studio changed the face of design. For the past 30 years The Designers Republic has been tearing up the graphic communication rulebook. Founded by Ian Anderson, the provocative Sheffield-based studio grew from his design work for bands and clubs, before evolving into a creative-led group of individuals. Often described as "the design group that changed design", it's notable that the story of The Designers Republic (TDR) has never made it into a book. Until now. A recently launched Kickstarter project will explore the story of the studio's outputs, processes and influences for the first time. In the pages of A to Z of The Designers Republic – which we're sure we'll soon be adding to our 30 books every designer should read post – readers will hear from Ian Anderson himself as he shares why the studio works the way it does. "If you ask me what we do at Designers Republic, we solve problems and communicate the solution," says Anderson. "That’s my interest. The graphic design aspect is only something that’s there to improve the communication." "Thirty years of work pushing at the cutting edge, that’s really what we’ve done. [It’s] not like a mission statement, but that is effectively what we do … because of the nature of my personality and therefore the people I choose to work with." Amongst TDR's most notable works are visual languages for Aphex Twin and Autechre, as well as subversive and experimental design work for Sony, Orange and Coca-Cola. The studio has had its ups and downs over the years, with Anderson putting it into voluntary liquidation in 2009, but its tireless, revolutionary principles have always endured. A to Z of The Designers Republic has been described as a continuation of the studio's forward momentum. And while it usually looks to the future, the book will be a long overdue chance for the studio to take stock and re-examine its output so far, complete with insights into its working process. "There’s a big yawning gap in the literature of graphic design," says one of the book's editors, Adrian Shaughnessy. "There aren't many major studios from the past 50 years that haven’t had a monograph published, but there has never been a TDR monograph." "Unit Editions has made a habit of publishing books on designers and studios that have been neglected by other publishers. And there’s no bigger omission than TDR. 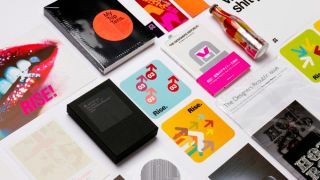 But finally, thanks to the people who have pledged via Kickstarter, we can now say that there will be a definitive TDR monograph – one that looks back over 30 years of graphic innovation, disruption, slogannering and rulebreaking." With a couple of weeks until the Kickstarter ends, A to Z of The Designers Republic has already comfortably smashed its funding target. "Now that we are fully funded, we are preparing to release some more awards – a few gems from the TDR archive that should get TDR fans salivating," adds Shaughnessy. So if you're after unique perks and the chance of seeing your name printed alongside The Designers Republic story, be sure to head over to the Kickstarter page and pledge what you can.